If you wrote a post on this or any of my other discussion topics today, Thursday June 24th, please leave your link in the Mr. Linky before midnight Central time (US) and you will be eligible to win a prize. 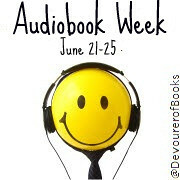 I know that some of us covered this on Monday, but I’m still curious about just where everyone listens to audiobooks. When I first started listening to audiobooks, it was car-only. Really, I just wanted something to take my mind off of my commutes. I was a big NPR fan, but for some reason I didn’t find ALL THINGS CONSIDERED quite as interesting as MORNING EDITION, so I’d drive to work listening to NPR, and drive home listening to an audiobook. Next, it was the gym. Yes, music got me pumped up to move, but after a few minutes I would be bored, bored, bored. I need plot to keep me interested in, well, pretty much anything, so I started bringing my audiobook with me on the bike and the elliptical. Then it was those long, boring times when I was really doing a deep scrubbing of some room. Now, as long as I have at least 5 minutes during which I will be doing something that does not involve me reading, writing, or listening to other words, I stick those ear buds straight into my ears: when I’m driving, working out, taking a walk, cleaning, folding laundry, drying my hair, coloring my hair, straightening my hair…. It’s amazing how many little moments there are to listen to just a little bit more of the story. Since I have to color my hair every four weeks and to get good gray coverage it processes for 45 mins., I am going to listen then too! Great idea. I couldn’t agree with you more, Jen. I started out just listening in the car, now I listen all over the place. I’m also going to be investing in a stereo for my iTouch so I can listen while I’m cleaning or crafting and not have to wear headphones will doing it. When I go to all day scrapbook crops I always take my iTouch along to listen as well. I know it comes off as unsocial to some, but I can only listen to gossip for so long. Then I really need to get into my own little audio book world! I’m right there with you. It is a little more difficult for me when the kids are home all summer, but during the school year, there is rarely a time when I don’t have the earbuds stuck in my head! I want to listen whenever I can, but I am surrounded by children all day and I worry now about tuning them out. So…now I just listen when I exercise. It does help make the workout less horrible. I listen in my car like so many others. I have just found that I don’t enjoy the radio or music CDs as much as I do listening to audiobooks. I listen in the car, when I’m walking the dog, when I’m cleaning and when I iron. I’m going to have to try out listening while working out and see if I like it! I’ve started listening to audiobooks pretty much any time where it isn’t impossible (or rude) to do it, in particular in situations where reading a print book isn’t feasible. Since the Mr. Linky is down, here’s my post for today’s topic. Here’s my post — complete with photos! In addition to listening while doing most of the activities listed above, I’ll just add that listening in the car as a passenger is wonderful to me because I can’t read print in the car due to motion sickness issues. I also enjoy listening in my favorite rocking chair at home – I can sit and rock and listen all I like – reading while rocking back and forth requires more hand-eye coordination that I’m able to muster. i started listening to audiobooks when i was training for my first marathon. running for hours can get seriously monotonous and having a book was a great distraction. once i got through that painful event, i started looking for other moments that i could continue the audiobook experience. since i take my dog to the dog park a couple times a week and i can’t keep an eye on him with my face in a book, i started taking my iPod with me there, which gives me about an hour of uninterrupted time. For the most part, I am still in car mode. I’ve ventured out in a few places when listening, but not many. You and Beth F really have me thinking about other opportunities. Like Literate Housewife, so far, I’ve been listening while driving; and also while walking in the morning. But I’m getting great ideas from you seasoned veterans. Keep them coming! I listen while driving, working, walking, and during monotonous chores. I guess the audiobookers wore Mr. Linky out! I just noticed the note that he’s down for the count. Here’s the link to my post: A Novel Review Is this what we’re supposed to do? Pre-Dawn Hours: Surfing the web, checking out blogs… Sorry no picture of ME at this hour! And now I’m home, checking my work e-mail and feigning interest in housework. Tonight, after I put my daughter to bed, I’ll be reading some more of an ARC of THE BELLS (by Richard Havrell) with the objective of making a casting recommendation by Monday. I don’t know if mine came through. Thanks for bearing with me today while Mr Linky was down! I’e entered everyone’s links from the comments.